From topical pain medications to yoga, these strategies provide nerve pain relief that lasts. Nerve pain symptoms range from mild tingling sensations to burning to intolerable stabbing pain. Our bodies contain billions of nerves that send billions of messages to our brains and spinal cords. Messages like, “Ouch, that’s hot” or “Yikes, that hurts.” Any damage to these nerves can disrupt the messaging process, causing a multitude of problems. Your nerves may send pain messages when there’s no reason to, for instance. Or, damaged nerves could leave you without feeling in your hand, meaning the “ouch, that’s hot” message won’t get through. 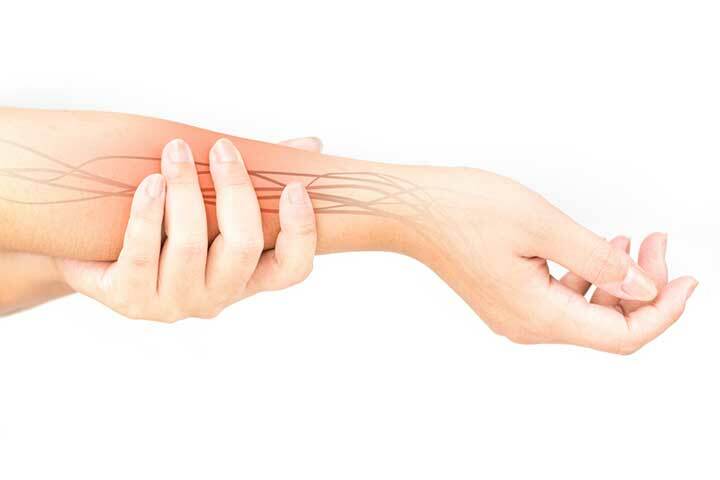 With almost 20 million Americans suffering from peripheral neuropathy (nerve damage to the arms and legs) it’s no wonder so many of us are searching for nerve pain relief. Far too often, treating nerve pain is an uphill battle. As stated by researchers of a study published in the journal Frontiers in Cellular Neuroscience, “Chronic neuropathic pain is difficult to treat and is often characterized by either exaggerated responses to painful stimuli (hyperalgesia) or pain resulting from stimuli that would not normally provoke pain (allodynia).” In other words, our bodies go into hyperdrive with all guns firing; only they’re shooting pain signals instead of blanks. Looking for nerve pain relief? Read on to find ways to reduce your discomfort. Pain is subjective, which means we all feel it differently. Depending on the severity of your nerve damage, location of the impairment, and other medical factors, you may sense a lesser or greater amount of pain than others with a similar affliction. Symptoms range from mild tingling sensations to burning to intolerable stabbing pain. Nerve pain can be a serious, debilitating condition. While mild pain can be relieved by certain natural methods, more severe pain may require prescription medications or other treatments to find true nerve pain relief. Seek help from a medical professional to find the right treatment for your condition. What Medications Can Provide Nerve Pain Relief? While over-the-counter medications (such as acetaminophen) or an NSAID (like ibuprofen) may help in certain cases, they don’t often reduce severe nerve pain. Talk to your doctor about other medications such as anticonvulsants (for example, Neurontin), gabapentenoids (e.g., gabapentin and pregablin), and antidepressants (e.g., Cymbalta and Prozac). When medications aren’t enough to reduce the pain, or their side effects become more bothersome than your symptoms, try adding other, more natural options for optimal nerve pain relief. Rub on a topical pain killer. Over-the-counter concoctions such as St. John’s Wort oil or creams that contain capsacin (from hot chili peppers) can be rubbed directly on an area causing the most pain. It burns at first but is said to reduce pain and inflammation. Creams containing lidocaine can help numb the region, but their effects are temporary. Get a massage. A small 2012 study found that having a massage (or six, weekly 60- to 75-minute massages in this case) can reduce the severity of nerve pain. In the study, massage aided in manipulating and mobilizing the patient’s foot and leg (the areas affected by her nerve pain), reducing her discomfort. Massage can also work by releasing tension and promoting relaxation. Acupuncture. This ancient Chinese practice of sticking thin, metallic needles in specific points of the skin or body (the hand or feet, for example) can offer nerve pain relief. The needles alter the flow of energy (a.k.a. the qi) and may help release endorphins, the body’s natural pain-relievers. While evidence is varied as to its true effects on pain, acupuncture may be worth a shot. Make sure to see a certified acupuncturist to ensure the best, safest treatment. Physical therapy. Physical therapy is a treatment of choice for dealing with chronic nerve pain. Regular sessions can provide nerve pain relief by strengthening weak areas, increasing range of motion, and teaching patients how to move to reduce discomfort. Biofeedback. A process by which we learn to control some of our body’s more major stress responses (e.g., heart rate and breathing). Electrical sensors provide feedback about our body. This “feedback” alerts our brains to an imbalance and reminds us to focus on that area of tension (or pain) to help relax (or relieve) it. A 2015 pilot study of paraplegics suffering from central neuropathic pain found that neurofeedback training (a type of biofeedback that tracks brain waves) reduced both immediate and long-term pain. Exercise. While this may be the last thing you want to do when you’re in pain, multiple research studies have proven that regular exercise (e.g., a 30-minute brisk walk five times a week) can decrease pain. A 2017 review of 381 studies found that exercising may reduce the severity of nerve pain, increase physical function and improve quality of life. Here’s how: physical activity boosts blood flow to nerves and helps reduce inflammation. Practice yoga. Yoga provides nerve pain relief in three ways: by strengthening the body, (thereby improving posture), increasing flexibility and promoting relaxation. Authors of a study published in Integrative Medicine International claim that yoga can relieve low back pain and improve balance. Despite recommending further research, they suggest adding yoga to a nerve pain relief regimen. Quit smoking. A small study found that smoking dramatically increases nerve pain. When one of the two men studied quit smoking for one month, his pain disappeared. After he resumed smoking, his pain returned at a level of 8.5/10 in the morning and 5/10 in the afternoon. Get Botox. More than just a cosmetic treatment, Botox, a toxin used to weaken or paralyze certain muscles, can also block nerves, providing nerve pain relief and preventing migraines. A 2015 study on mice found that injecting Botox (type B) produced long-lasting reductions in pain caused by nerve injury or chemotherapy-related nerve damage. Try Cognitive Behavioral Therapy (CBT). This method of psychological therapy attempts to correct ingrained patterns of negative behaviors and thoughts. CBT can help teach coping methods to help deal with and possibly lessen chronic nerve pain. 5 htp, 5 htp benefits, acupuncturist, antidepressants, anxiety, arthritis, b12, back pain, brain, cancer, chemotherapy, chronic fatigue, chronic neuropathic pain, cognitive behavioral therapy, depression, depression anxiety, diabetes, endorphins, exercise, fibromyalgia, gabapentin, ginseng, ginseng benefits, htp, improve balance, inflammation, integrative, low back pain, lyme disease, massage, migraines, multiple sclerosis, nerve pain, neuropathic pain, one of the best fibromyalgia supplements, pain, pain management, pain relief, pain relievers, panax ginseng, panax ginseng benefits, physical activity, pinched nerve, posture, quit smoking, reduce inflammation, rheumatoid, rheumatoid arthritis, sciatic nerve, sciatic nerve pain, sciatica, sciatica pain, severe pain, Shingles, side effects, skin, sleep, smoking, stress, stroke, supplements, vitamin. Grammar issue: you are using i.e. as if to mean” for example. “The actual abbreviation is e.g. Lyrica worked well for extreme nerve pain in my foot, until I couldn’t tolerate it anymore. Now I am on Medical Marijuana (in Canada) and it works like a charm. Try it! Name. Is. Not. Wanted . I saw this other form of pain relieve i was wondering if it is good or not. Its called wild lettuce. Does anybody know or have tried because ive been looking for every solution out there and the wild lettuce pain relieve sounds interesting since its natural. I’ve been searching google for a workout and reading some reviews but there’s very limited info on a lot of the popular online back pain programs. I was thinking of buying a program like sciatica sos one or something like that, but this review made me look into it more https://extremehealthguides.com/sciatica-sos-review-results/ which is how I found your website. It’s also made me think that popular might not mean it’s worth the money. There’s not many reviews on google. But, I am just wondering what makes a relief for lower back pain? What more should I do, and will I need more then just a back pain program that I can do at home but online? I don’t want to waste money and all of the reviews make good points and offer some good alternatives. It’s confusing me a bit. My father has been having a lot of nerve pain over the past year. It is good to know that things like physical therapy and acupuncture can help him get some relief. It might also be smart for him to consider talking to a pain management doctor. You gave very good information. Yes marijuana pain relief balm is the right medicine for joints pain, muscles, and back pain problem. it can also help to reduce the an anxiety, depressions, and worries into the mind.